I imagine I cried as much as everybody else, but I did have an advantage over most of the children – I could read before I started school. 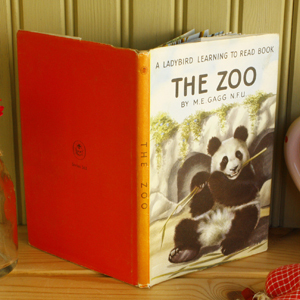 My favourite book at home was The Zoo, published by Ladybird Books. I can still picture the scene when I looked in the reading book box and saw, to my amazement, that there was my favourite book! What was my book doing in class? I hadn’t brought it in, so maybe it had got there by magic! (To me, anything I was fascinated by but didn’t understand was magic; e.g. how did The Beatles manage to sing all the words of their songs on the TV without having books in front of them?) After seeing my favourite book in school, and finding out that there were even more copies in the class cupboard, my approach to school immediately improved. This was the place for me (even though I got whacked with a ruler for making the tail on my ‘g’ too curly). I was reminded of this major turning point in my attitude towards school when I heard about two-year-old Billy. 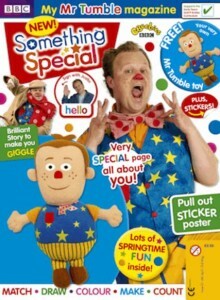 Billy was a die-hard CBeebies fan, and at the time Mr Tumble was his favourite character. Like many two-year-olds, he liked to browse the children’s magazine section every time he went shopping in Sainsbury’s, in the hope that the latest CBeebies Weekly was on sale. ‘Browse’ is not really the operative word here. If you’ve ever passed that section of the supermarket you will see tiny tots taking part in shoplifting, as they grab their favourite magazine and make a run for it, or try and sneak it into Mum’s shopping trolley. One day Billy went to Sainsbury’s with his Grandpa (Mum’s Dad). As Grandpa couldn’t possibly refuse little Billy’s wishes, Billy got to take home a copy of the very latest CBeebies Weekly, featuring a four page spread on Mr Tumble, a Mr Tumble free gift and stickers. This is quite typical of two-year-olds, who gain great comfort from sameness. Young children in day care and pre-schools are particularly pleased when they find that the books and toys that are on offer are the same as the ones that they have at home. For a two-year-old, sameness is reassuring. It’s no wonder that ‘same’ is a word that they learn very quickly. But this type of experience is important for older children too. I was visiting a setting to give advice about how they could improve their book corner. Staff knew about my interest in helping children who are very quiet and anxious, and pointed out a little girl called Rhiannon. She was causing a lot of concern because the adults had rarely heard her speak, though she was known to chat away with her mum at home time. I was sitting with Rhiannon and two other children in the book corner, and took some books out of my bag. One happened to be The Story of Peppa Pig. Rhiannon smiled a big smile and whispered, “I got that book at home. My Grandma buyed it for me.” This led to a big discussion among the children about Peppa Pig, and what books everyone had at home. This was a turning point for little Rhiannon, as well as for the setting’s book area. We set up a project where children were encouraged to bring in their favourite book from home. There was always great excitement when the children discovered that there was a copy of their book already in the setting. Staff tried to find their favourite books from their childhoods, and brought these in to share with the children. They made a display of children’s and adults’ favourites, and invited the parents to join in too. This was phase one of our ‘book corner makeover’, and we were all particularly pleased with the links we had made between the children’s home interests and what was available in the setting. Finding Ladybird’s The Zoo had been the start of my being able to relax at school, and seeing The Story of Peppa Pig had done the same for little Rhiannon. She remained relatively quiet, but grew in confidence and was much happier about joining in with groups and talking. Incidentally, The Tiger Who Came to Tea remains by far and away the most popular book from practitioners’ early childhoods, and is still a massive favourite with the current generation of early readers. Further challenges for presenting books to children as the precious new journeys of thought they offer. Yes this happens with songs a lot – you sing Spiderman or anything that is on a DVD or television and children are very moved by the fact and exclaim delightedly “I’ve got that at home” It’s a powerful bridge. I think it is more than interesting to find that starting school at four was just as negative an experience for you as it is for children now! Thanks for that valuable bit of first hand experience. LOVE this blog! Its so true. It explains why people buy the boxed DVD set of a whole TV series and why a concert of Beethoven’s 5th always sells out more quickly than Beethoven’s 1st. Its not only people with autism who like sameness!! I deliver training on Quality Transitions and suggest that the setting and school should agree on a set of familiar books and songs so when the children start their new school (or move rooms in a day nursery) they immediately recognise some familiar things. Another good idea to make children feel at home is to paint pictures in their old setting then the new one displays them so when the child walks in for the first time, there’s their painting! As an adult, I still believe in magic. When I do not understand how something amazing happens, I consider it to be magical. For an example, when my husband and I bought our computer and installed a router so that we had internet access from our dish throughout the house, I thought the router was magical (I still do). Sometimes, people will provide me with an explanation for how something happens, whether I ask for it or not. This can spoil the “magic” for me. I think that all of us would be happier if we experienced a little bit of magic in our lives.